Normal maintenance for Nintendo joysticks is to apply a drop of 3-in-1 oil on the bearing if the joystick feels sticky or doesn't always return to center when released. If you are restoring or cleaning an old gummed up assembly, you may want to disassemble it, clean the bearing thoroughly with solvent, or WD-40 to get most of the gunk out, then clean it again with warm soapy water. Dry the base with compressed air to remove any moisture, then re-lubricate the bearing as normal. While you have the stick apart, if you find you have worn pieces, we carry a complete line of replacements parts for these joysticks in the online store. Nintendo Joystick ball and shaft assemblies are measured from the top of the ball, to the top of the E-Clip slot. 4-way joystick TKG-23-50, with a 25mm Ball Top. The total length of the ball and shaft assembly is 82 mm. Also used in Donkey Kong Jr, Donkey Kong 3 and Popeye tables. 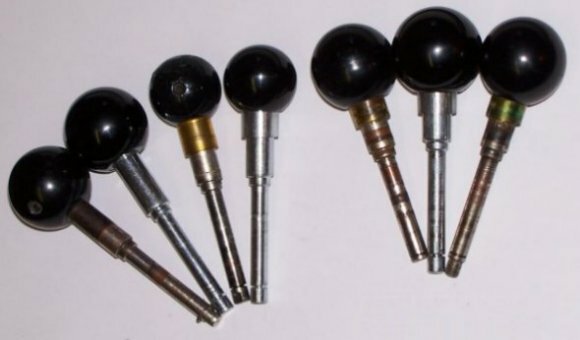 4-Way joystick TKG-23-50, with a 30mm ball top. The total length of the ball and shaft assembly is 86 mm. 2-way, TKG-23-50 based, shaft is shorter by 5 mm below the ball top, plastic base plate added for metal control panel installation. 28mm Ball Top is molded on the joystick shaft. Ball and stick assembly measures 80.5 mm long. 8-Way. Same Joystick as the Mario Bros Joystick, with the 2-way guide plate replaced with an 8-way guide plate. Ball and stick assembly measures 80.5 mm long.